Does the world really need another compact crossover? Maybe not, but Mitsubishi clearly does if it wants to continue its climb back to from obscurity in this country. The largest and fastest growing segment in the auto industry, compact crossovers now dominate the lots of suburban malls, high schools, and office parks across the land. 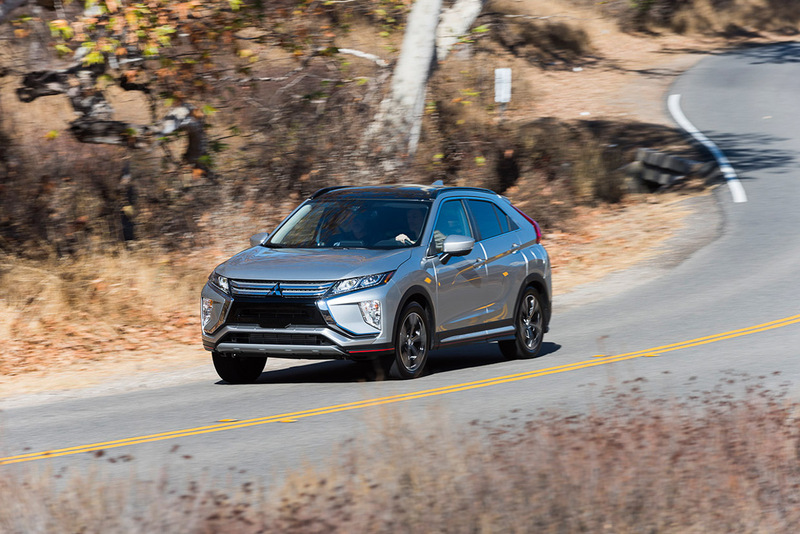 Led by the Nissan Rogue, Toyota RAV4, Honda CR-V, Chevy Equinox, and Ford Escape – Mitsubishi dives into the category with an old name but a familiar strategy. Let’s start with the name and its relevance. Though the badge says “Eclipse,” this vehicle is not a spiritual successor to the sporty and fun coupe that bore the name the 1990s. It is a mainstream crossover with a new turbocharged engine, and a transmission and handling dynamics that while plenty competent, won’t conjure up any images from the Fast and Furious films. As much as Mitsubishi tried to convince us of its “coupe-like styling,” this is much more Cross than Eclipse, and for hundreds of thousands of American motorists, that’s probably okay. 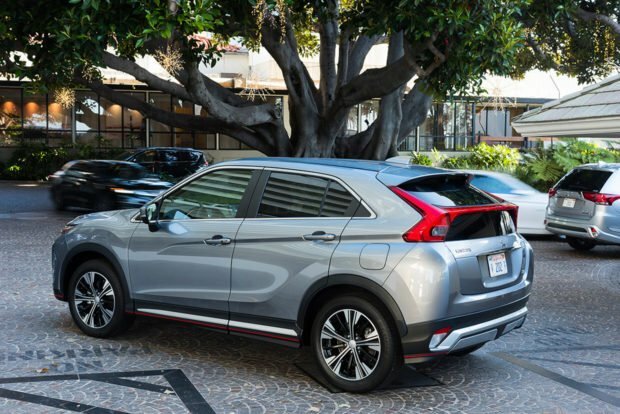 What the Eclipse Cross has in spades is looks. This is a well-designed vehicle inside and out. While it follows some of the creased and folded conventions of the category the Eclipse Cross stands out from the offerings of Toyota and Honda, striking a nice balance between unique and familiar. 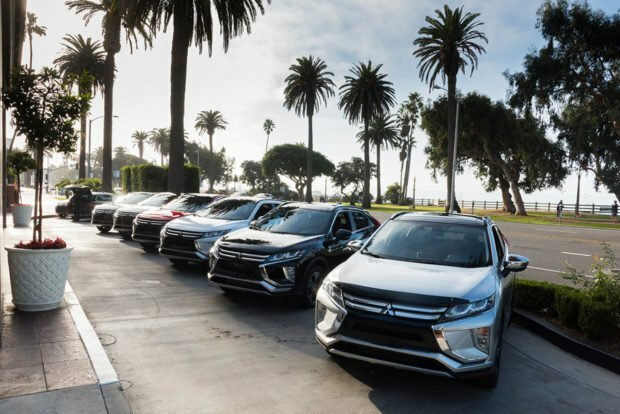 The Mitsubishi front end bears a slight resemblance to the pinched look of the Toyota/Lexus family, but isn’t carried to the same extremes. The head and fog lamps are set well out to the edges making the Eclipse Cross feel wider than it is. A character line runs from just behind the front wheel into the taillamp at a rakish angle, adding to the crossover’s purposeful look. Our SEL Touring was equipped with faux carbon trim pieces in black with sporty red striping along the rocker panels and front. We’re not big fans of faux material and would rather have just seen matte black here, but it’s not bad. Another interesting choice – and not one we’re sure we like is the taillamp splitting the rear window. It looks fine, but in practice does compromise the visibility out the rear a bit. 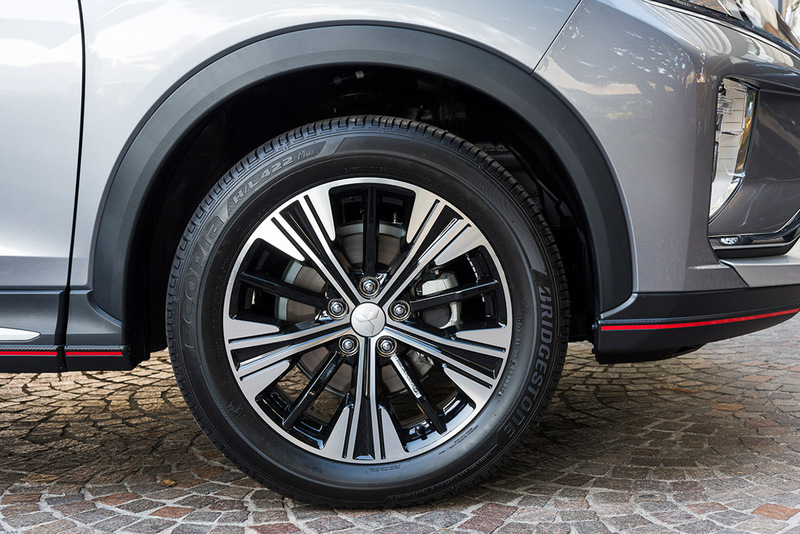 The 18-inch alloy wheels complete the look and add to the Eclipse Cross’s sporting promise. Inside the Eclipse Cross is clean, uncluttered, and comfortable. A large speedometer and tach dominate the instrument panel, with a small, customizable TFT display in between. Above the instrument panel, a four-color heads-up display is projected into a small plastic screen that flips down when not in use. To the right, a 7-inch touchscreen rests atop the center console. Material choice is sound, if not spectacular, and the fit and finish, even on our pre-production test cars was first rate. I appreciate the tactile buttons for the HVAC controls, but would have preferred real volume and tuning knobs for the radio as opposed to touch screen control for those functions. There are several blank switch and button covers on the dash and steering wheel that just give you the feeling something has been left out. The leather-wrapped steering wheel is very comfortable, sized just right and for those in northern climes can be ordered with heat to keep your digits toasty on those frosty mornings in February. 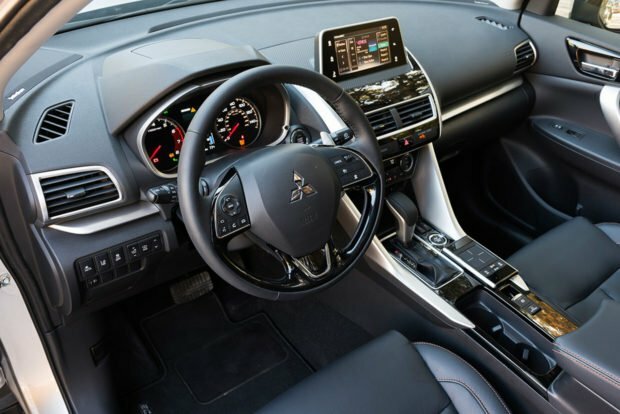 Supportive and comfortable leather seats are standard in the SEL, as our host said, in Mitsubishi nomenclature “L stands for leather.” Heated seats are standard up front and optional in the rear. Speaking of the rear seats, they offer plenty of room for six footers, even if full-size adults are sitting up front. And, though there are three seat belts back there, I wouldn’t want to be sandwiched between two 200 pounders. This is a compact crossover after all. The rear seats slide and recline which is a nice touch. 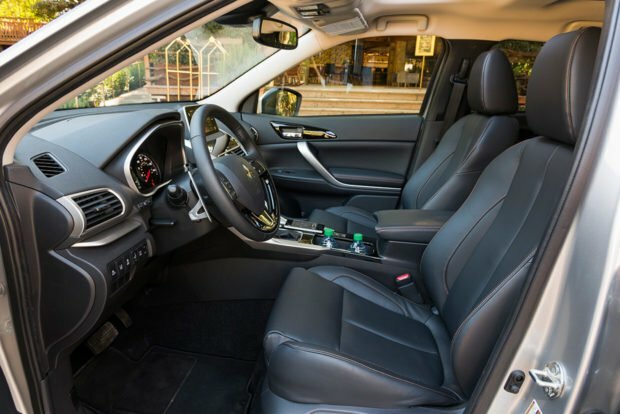 They also offer 60/40 split seatbacks that fold nearly (but frustratingly not completely) flat, adding to the vehicle’s utility and convenience. What really distinguishes the Eclipse Cross from the others in the category is Mitsubishi’s new turbocharged, 1.5 liter, 4-cylinder engine. This is one willing engine. The numbers are solid (152 hp at 5,500 RPM and a nice flat peak torque of 184 lb.-ft. from 2,000 to 5,000 RPM). While you won’t confuse this for a Tesla in Ludicrous mode, it feels quick off the line. The all-new engine features a number of technical bits like direct injection and sodium filled exhaust valves which aid performance and drivability. 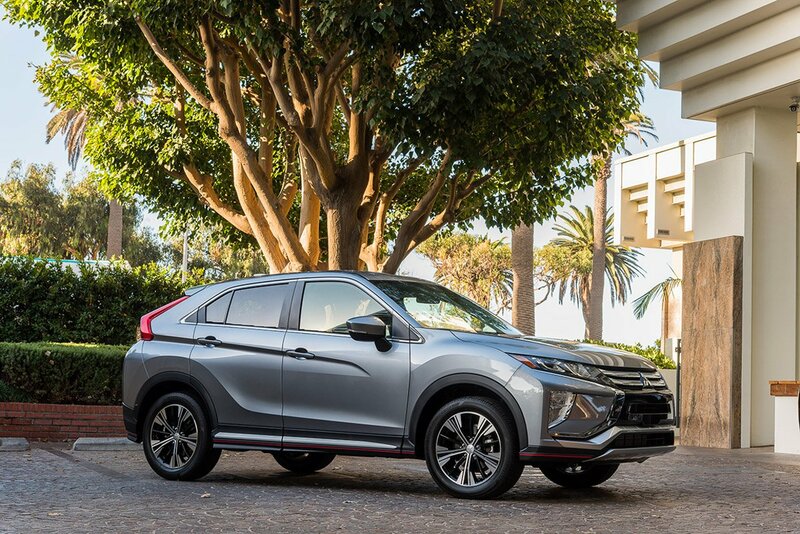 With a rating of 1,500 pounds, the Eclipse Cross can tow a small trailer so you can bring your jet ski or snow machine along with you on your adventures. The CVT, however, doesn’t do the engine any favors. Even though the transmission has a sport mode with eight simulated gear shifts via steering wheel mounted paddle shifters, it still has a bit of that rubber band feel that plagues all CVTs. What we would have given for a traditional 6-speed (yeah, yeah, we know that only us and about six other people would order it this way) or a DCT like Kia is using in the Niro. Both would have made this engine shine. As it is, the CVT dulls its edge and that’s really too bad. The ride and handling on the other hand were pleasantly surprising. 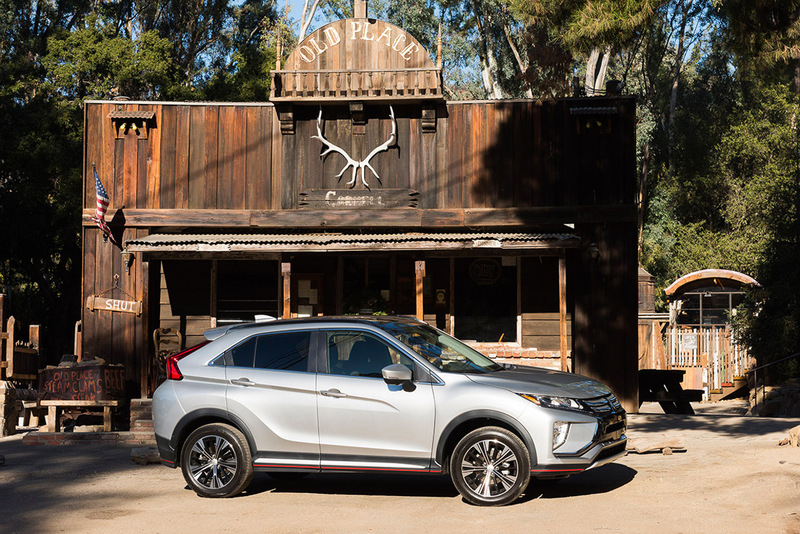 Again, you won’t confuse this for a low-CG coupe, but even with its high waistline and the bulk that comes with all that extra sheetmetal, the Eclipse Cross gets around corners with confidence. Turn-in is direct and predictable. The electric power-assist steering transfers enough information to the driver’s hands. It’s light and quick with just 2.9 turns lock to lock and a very nimble turning radius of 34.8 feet. Combined with Mitsubishi’s Super All-Wheel Control (S-AWC – don’t ask us why the dash moves) the Eclipse Cross dug confidently into the corners on California’s famous Mulholland Highway. Even pushing it so hard the tires were howling in protest, the little ute held its line, never feeling like we were anywhere near a trouble spot. S-AWC uses all-wheel drive, active stability control, anti-lock brakes, active yaw control and a series of sensors to put the power to the appropriate wheels, keeping things from getting wonky if you go into a hairpin a little hot. The S-AWC system also has three drive modes, – Auto, Snow, and Gravel – to optimize the traction for specific road conditions. We didn’t get to test out this system on any surface other than pavement and a quick donut on a gravel turnaround, but given the ubiquity of these on almost every AWD system from other manufacturers, we believe the Mitsubishi folks when they tell us it makes life easier when you encounter the aforementioned road conditions. 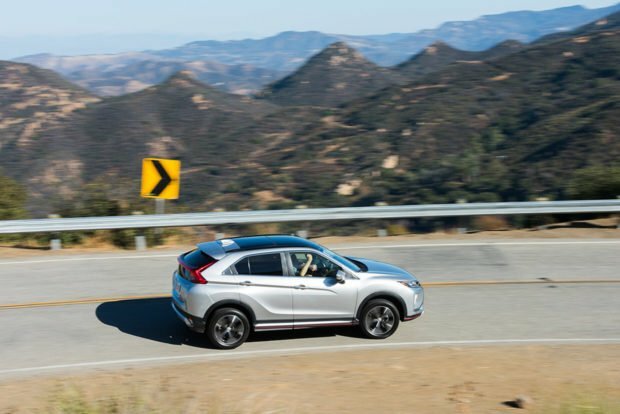 The Eclipse Cross comes with a fairly comprehensive suite of safety features standard, but you have to move up to the SE and SEL to get blind spot warning with rear cross-traffic alert, and lane keep assist. You can also add a safety technology package to the SEL that includes auto high beams, forward collision mitigation, lane departure warning, and adaptive cruise control. Our tester had all the bells and whistles and they worked well. My co-driver even decided to put the forward collision mitigation to the test, coming in a little hot (on purpose he assured me) to a stoplight and the Eclipse Cross clamped down on its 11.6-inch ventilated disc brakes with vigor. So the upshot is this. The Eclipse Cross is sporty looking, incredibly well equipped for the money, has a really nice motor, and drives as a mainstream compact crossover should. Given that this is the largest segment in the automotive landscape now (and still growing) there’s certainly a place for it on those shopping a Rogue, CR-V, RAV4, or Equinox who want to keep a few thousand extra bucks in their pockets. Is it best in class? Maybe not. Is it a really nice option for a lot less cash? Definitely. Just don’t expect to see this Eclipse sliding through corners in a Hollywood blockbuster anytime soon.